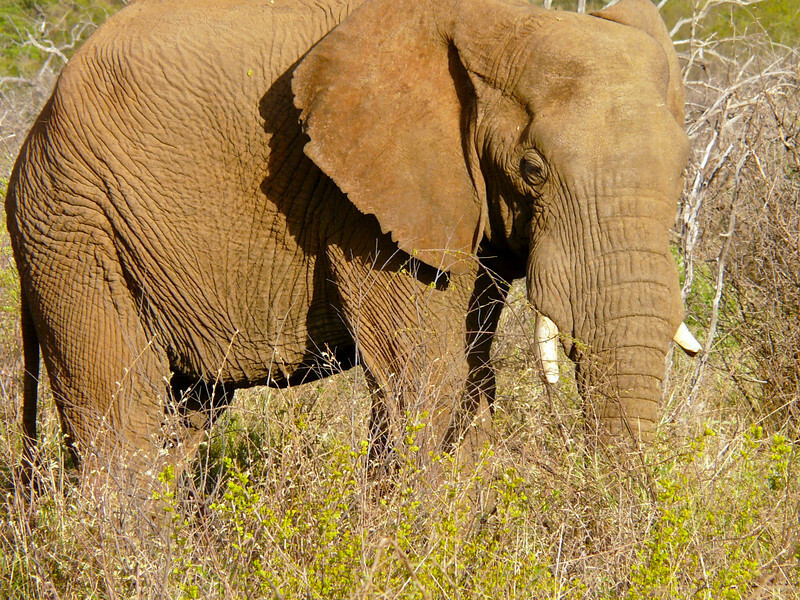 On a morning game drive in Madikwe Game Reserve, South Africa, our ranger, Jaco, stopped at a hillside to point out an elderly male elephant with a bedraggled ear and one broken tusk roaming in solitude. He looked tired and lonely. Was this grassy hillside near the Botswana border the equivalent of an elephant retirement home? Did this prove that elephants really do separate themselves from the herd when it’s time to pass on? Had he come here to die in the Madikwe equivalent of an elephant’s graveyard? A safari is an opportunity to observe wild animals in their environment. The pace alternates between sitting patiently waiting for something to happen and a frenzied rush to reach a special sighting radioed in by another ranger. In this case, we simply sat and watched an elderly elephant moving slowly through the grass waiting for the end. Thinking about planning an African safari? Check out all the information on our complete Safari Page as well as collection of South African Wildlife Photos, both great resources for active boomer travels in Africa! Alan and I look at the natural world much differently since our South African experience. No wonder it’s a at the top of many travel bucket lists. Have you traveled on a safari? Join the conversation at the My Itchy Travel Feet page on Facebook or send us an email to ask a question or share your experience.